Michelle Cooper, the award-winning, best-selling author of The Montmaray Journals has blogged about her experience of writing and publishing Dr Huxley's Bequest at her blog, Memoranda. I've been looking forward to reading this book ever since Michelle first mentioned it was on its way, and I was not disappointed! Dr Huxley's Bequest is fiction, but it contains a lot of facts -- it's a short history of medicine wrapped in a palatable mystery/quest/friendship narrative, just like a sugar shell disguising a pill... but that's a poor analogy, because in this instance, the pill is just as tasty as the wrapping. 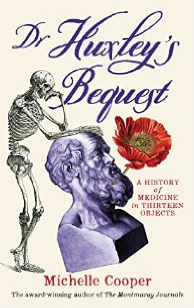 Via thirteen mysterious objects, short, chatty chapters lead us from ancient Egyptian medicine, through the classical era to medieval plagues, vaccines, scurvy and much more, right up to the ethics of genetic testing, the fight against malaria, and sexism in science. This book would make a wonderful read-aloud (I accidentally read some to my sixteen year old and she begged for more) or an equally great read-alone for younger readers (it's already been noted eagerly by a librarian friend looking for recommendations for a student who can't get enough to read about medicine and science). Highly recommended.